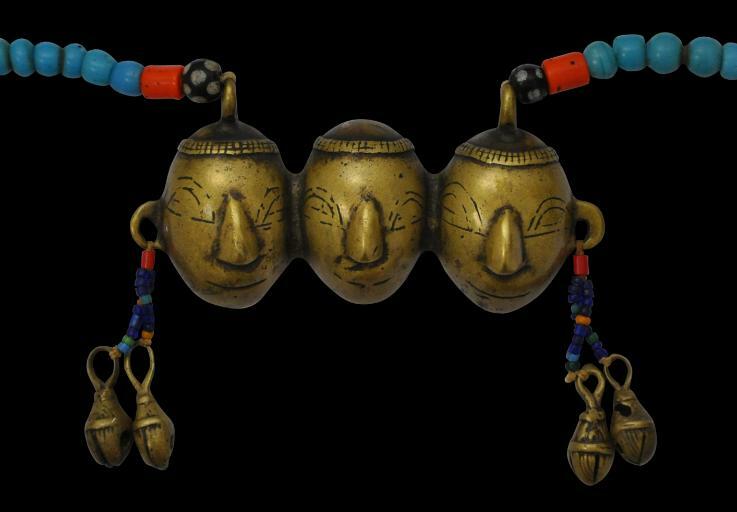 This splendid Naga necklace comprises a series of glass trade beads (probably from Europe and China), and a pendant of three cast brass trophy heads with suspended cast brass bells on beaded tassels. The dotted black beads are most likely from Venice where such beads have been produced since the early 19th century. 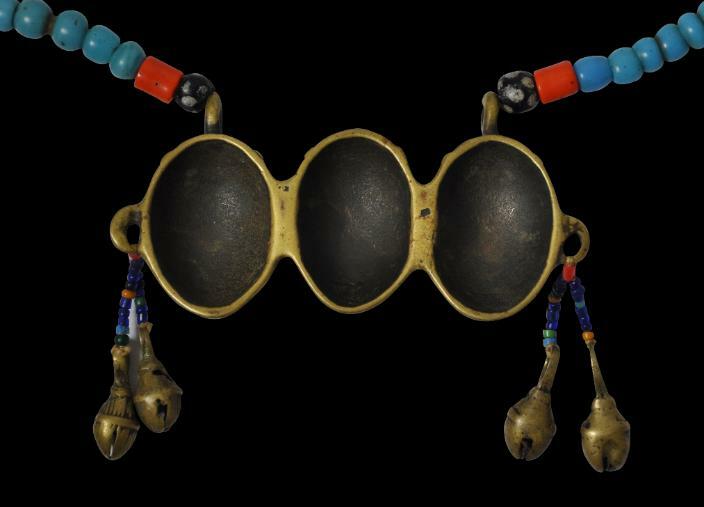 Necklaces of this type with representations of severed human heads traditionally were reserved for warriors who had successfully taken heads. Probably, the form was copied from Indian brass box lids (Jacobs, 1990, p. 252). The necklace and all its constituent parts have excellent patina: it has clear age. The trophy heads have wonderful wear and patina. This is important because modern reproductions abound. There are no losses and the necklace is stable and wearable. to see a related although less elaborate example in New York’s Metropolitan Museum of Art. The Nagas: Hill Peoples of Northeast India, Thames & Hudson, 1990. Middle Eastern and Venetian Glass Beads: Eighth to Twentieth Centuries, Skira, 2007. The Naga of Burma: Their Festivals, Customs and Way of Life, Orchid Press, 2005. Naga Tribal Adornment: Signatures of Status and Self, The Bead Museum, Washington, 2003.